When talking geography, people say they’ve traveled to the four corners of the globe... which has always confused me because a globe has no corners. But then again, we’re talking geography here and not geometry. People also travel to the four corners of a country, except in France. France is L’Héxagone, which should require no translation. And as a hexagon, it has six corners. I’m off to one of them, the very southwest corner, the Basque one that’s just pre-Spain. I have big hopes for this trip after six weeks of crummy weather not worthy of the end of spring. Something about the words “June” and “heating” just aren’t meant to go together. And there are only so many days you can use your umbrella before thinking maybe you should ask Mother Nature for your money back. So my hopes of finally drying out and warming up are high. Trains to Bordeaux and beyond to the Spanish border leave from the Gare Montparnasse, as do those to St. Malo (see On the Road: St. Malo on Brittany’s Côte d’Armor, June 29, 2013). Actually it services the entire west side of France. So it’s back across town on the métro and onto the TGV for a 5+ hour trip from the drizzle into the light (fingers crossed). 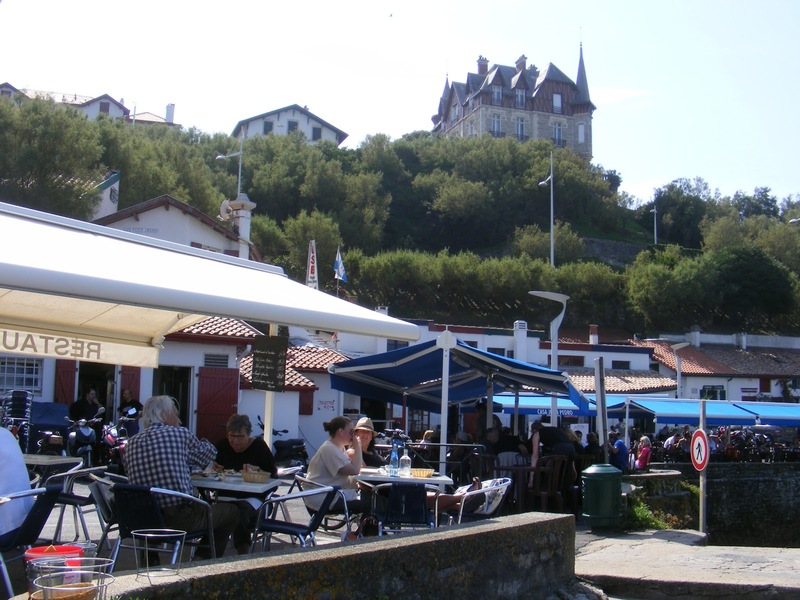 The train doesn’t stop until Bordeaux, after which it becomes a local for people - including many locals - traveling between Dax, Bayonne, Biarritz, St. Jean de Luz and finally Hendaye at the border. The car I’m in is sold out, with many seats occupied by a young Chinese contingent of both sexes who get off in Bordeaux. One, who is bilingual, appears to be the organizer for the others and I’m sorely tempted to ask him what their business is. Perhaps a tour of the wine châteaux for a wine tasting or to scope out the next area of investment for the Middle Kingdom? After Bordeaux comes a dreary ride across the pine forests planted under Napoleon III in what was just marshland before, and pasturing for the sheep who give milk for those wonderful cheeses with unpronounceable names: askorria, ossau-iraty, idiazabal... This is the Landes, the moors which produce a huge share of the wood used in construction all over the country. Then comes the bridge over the Adour and into Bayonne, the only major port between Bordeaux and Spain, famous for making chocolate a popular import from the New World. After that, there’s just enough time to put away the book and gather up my “effects” before Biarritz. The train station is on the edge of town, to which it was exiled so as not to bother the glitterati of this financially comfortable resort town. 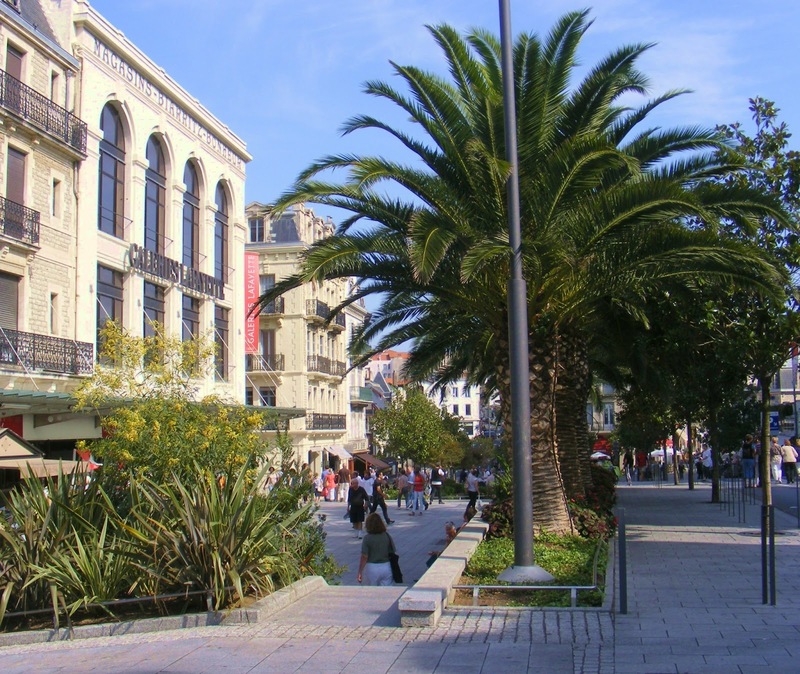 The short bus ride to my friend’s apartment wends its zigzaggy way past the camping grounds near the beach, then along the coast and past splendorous seaside buildings dating from the Belle Epoque through the Roaring Twenties. There has been much money in this town - first the nobles of Spain, then the court of Napoleon III and Empress Eugénie, then the wealthy Russian émigrés who made a timely exit from Lenin’s new deal with far more than just their lives, and then the movie stars of silent films. And there still is money here. It’s a town of casinos, four-star hotels and thalassothérapie, complete with an airport that sees passengers such as Cameron Diaz, Madonna, Julia Roberts and soccer star Ronaldo fly in often. And then there are the regular people, like my friend born and raised here until she moved to Paris for work, people who love the mild climate that makes living on one’s terrace such a pleasure pretty much year-round. Plus enough rainfall to turn the countryside green, unlike the Mediterranean coast. This town of 26,000 was once just a tiny fishing port known for its whaling ships. They plied their trade all the way to the Great Banks off North America long before Columbus discovered the New World. So much so that the crest of the town is a dory floating over a huge whale. Five whalers are in the dory, one with an anchor at the stern, one with a harpoon in the bow and the three middle men pulling hard on their oars. Above all that are a star and two scallop shells to indicate its position on one of the Compostella Roads, the route that ran along the Atlantic Coast all the way from Mont St. Michel (see Mont St. Michel, April 4, 2012) to Hendaye. The Port des Pêcheurs (fishermans’ port) and its handful of crampottes, tiny fishing shacks clinging to the cliff overlooking the port, is all that’s left of the old town. The sandy beaches just down the coast became prime real estate only when swimming evolved into a pastime in the 19th century. Before that it was of no interest whatsoever because it afforded no safe anchor for ships... and because water was synonymous with drowning. Now it’s off in its own corner, far below the shopping district atop the cliff, and cut off from the vast beach by the Rocher du Basta. 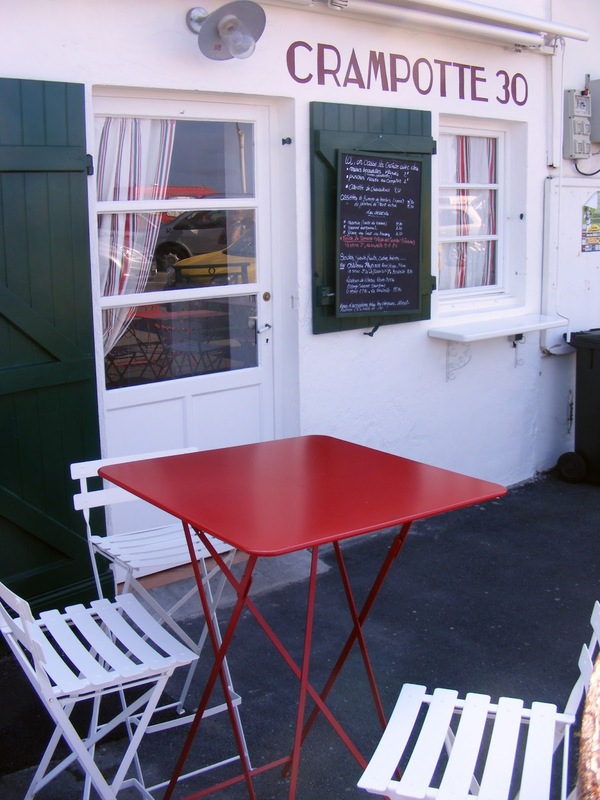 It still offers mooring for small boats, and good food at three restaurants, plus a few shacks filled with surfing and boating gear. And maybe one or two of those crampottes still have a cot to sleep on, but if anyone still “lives” in them, I’ll bet they use the toilets at one of the restaurants. We have lunch outdoors on the dockside at Le Corsaire, my friend’s favorite, where the waiter proudly announces that the fish is fresh off the boats this morning - except for the tuna that comes from across the border. We choose to share the first course - moules marinières and also fresh anchovies a la plancha - before moving on to fish for her and grilled prawns for me. The food is excellent, the crisp white wine chilled... plus the sun is out so we’re thankful for the parasol over our heads. I notice there’s a ship out at sea. A half hour later, it’s still there. And remains there until finally we ask the waiter if he knows why. He explains that it’s waiting for a berth at the docks in Bayonne, just up the coast. This evidently happens all the time, and by the time our meal is over, there are three of them anchored offshore. Like I said, Bayonne is a busy port. After lunch we escape in time to miss the blaring loudspeakers just a stone’s throw down the docks. They accompany the final rehearsal for tonight’s amateur dance show. American rock music and tanned girls of varying ages do acrobatic routines, including a kick-boxing dance, as retired fishermen get off their bar stools to come stare and “rinse their eyes”, as the French say. My friend shows me the interior of Sainte Eugénie Church, named after Napoleon’s Empress. And then we walk to our bus along a shopping street that is half-chic half-bohemian, which offers me an excellent opportunity to buy a birthday gift for an upcoming party back in Paris. Another day we stroll along the beach from the lighthouse to the casino. I’d never been inside the casino, so we walk through. In addition to a restaurant indoors and out, there’s exhibition space (a health foods show at the moment) and a room with 200+ slot machines. Not my idea of a casino - which should be filled with elegantly-dressed people setting their chips down on green felt, a little ball spinning in a roulette wheel and a handsome croupier saying “rien ne va plus!” But the decor is wonderful - Art Déco and spacious halls leading to vast windows overlooking the ocean. There are comfortable armchairs to sit in and lots of peace and quiet. Anyone is welcome to sit and daydream in front of a view to die for. On the other side of the window, people are enjoying the sun and waves. 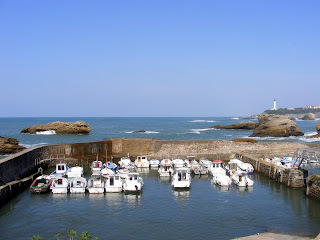 Just up the coast to the north is Anglet, the surfing capital of France. Here the waves are calmer and there are rock formations nearby, which makes for iffy surfing. But the tide is out, so there’s a game of beach soccer and plenty of children... plus quite a few dogs. A labrador with a tanned bather, a poodle with a businessman, his elegant linen pant legs rolled up, both dogs running after sticks. It all reminds me of my very young summers in Island Heights and Seaside Heights. Especially the waves. This is the ocean I learned to swim in, and I’d like to bring my family here. I might even buy a dog. P.S. On the train ride back up to Paris, I note that the three days without rain have allowed the Adour, the Garonne and the Dordogne Rivers to settle back into their normal beds. The difference in the water level is noticeable. It’s a relief to the entire area, which was subjected to major flooding in May and June. P.P.S. For those of you in and around New Orleans, the name Jean Lafitte may ring a bell. This famous pirate, the King of Baratiara, was originally from Biarritz. It’s summer, and that means salads. Not just green salads, for which you’d make a vinaigrette: French style mustard diluted in 1 part wine or balsamic vinegar and then 3 parts olive oil, with salt and pepper to taste. But also potato salad and tuna salad and egg salad... all of which require mayonnaise. Or plates of cold meats, such as sliced roast beef or lamb. But sometimes all that is a bit bland. So let’s put some zip in it. How? With some sauce! Some condiments! Some extra flavor! The following are a few basics I learned during my years in France. When I arrived, I hated mayonnaise. Then I learned that my mother’s favorite Hellman’s is to French mayonnaise what an ordinary mushroom is to a truffle: a joke. Once you know how to make a mayonnaise, you may want to make a bit extra and use it in these other sauces that are all mayonnaise-based: aïoli, rouille, tartare, faux béarnaise. It’s not hard. And it will make all the difference. Pressed for time, we spend inordinate amounts of money to make our lives “easier”. But sometimes it’s both healthier and more economical to make something yourself. Mayonnaise, for instance. Rather than buy a tube or jar of the phony stuff, full of industrial junk, why not make it yourself? You already have everything you need right there in your home. And it will keep in the refrigerator for at least a week. So make more than you need and just keep it refrigerated. Everyone will notice the difference, believe me. This recipe comes from French chef Pierre Franey. Combine the egg yolk, mustard, vinegar, salt and pepper in a mixing bowl. Stir with a wire whisk or a mixer. Add the oil in a thin stream while beating briskly. When the oil is incorporated, add the lemon juice and blend in well. Once you’ve got this down, you can go inventive, adding curry powder to taste for a yellow, Indian subcontinent flavor. Or to accompany cold fish, especially salmon, try adding spinach to make a green mayonnaise (2 c mayonnaise + 1 t Dijon mustard + ½ c finely minced, very well drained cooked spinach + 2 T minced fines herbs). 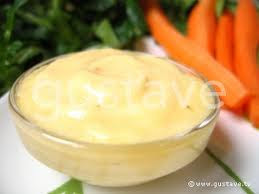 Blend all the ingredients into the mayonnaise using a wooden spoon or wire whisk. Again, working from a mayonnaise, add minced fresh tarragon and shallots plus freshly ground pepper, all to taste. And then there’s aïoli (pronounced aye-oh-lee), the Provençal answer to mayonnaise. Well, the Provençal answer to just about anything really. It’s all about the garlic (see quote above) and it makes things delicious. - Add one raw egg yolk, 1 boiled egg yolk, 3 pinches of salt. - Then, using a mixer, start beating them together, adding the olive oil almost drop by drop. When it starts to “take” (i.e. look like mayonnaise), you can go a bit faster. Very important: For this magic to work, all the ingredients must be at the same temperature, which usually means ambient temperature because that’s easier. That obviously holds for mayonnaise as well. If the aïoli starts to go bad, don’t worry. In a separate small bowl, mix together 1 clove of garlic, 1 raw egg yolk and a pinch of salt. Slowly beat them into the aïoli. If it ends up being too stiff, thin it a bit by adding 1 or 2 tsp of warm water. “Okay,” you’ll say, “that’s a LOT of aïoli! Don’t you have a smaller recipe?” Well, yes. This version by J-B Reboul allows you to make just what you need, depending on the number of guests. It uses the same ingredients, with the addition of some lemon juice. He makes it the traditional way, with a pestle and mortar. But I’ve changed it a bit so you can make it with a mixer. - Peel and crush the garlic cloves. Add a pinch of salt, the raw egg yolk, and then start pouring the olive oil in very slowly with the mixer on low. The aïoli should become thick. When you’ve poured in the equivalent of about 3 or 4 T of oil, add the juice of one lemon and 1 tsp of warm water. Continue to add the oil little by little and when the aïoli is very thick again, add a few drops of water. Otherwise it will appear to “melt” and the oil will separate. - Aïoli for 7 or 8 people will take a little over 2 c (½ l) of olive oil. OR you could just take some of that mayonnaise you made and add crushed garlic and some lemon juice if you’re really pressed for time. It might not be quite aïoli but it’ll be close. Now that you know how to make mayonnaise and aïoli, how about some rouille (roo-yah)? 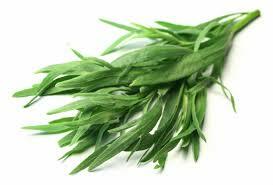 Again, this comes from Provence and is often used in fish stews or soups. The main difference is the addition of hot red peppers. That can be done easily with either tabasco (quantity to be decided by taste) or spicy paprika or piment d’espelette (although technically, that might make it Basque). Some people add a dash of powdered saffron, if only for the color. The recipe I have calls for an aîoli to which you add a pinch each of mild paprika, hot paprika (this is where the espelette comes in) and powdered saffron. Be sure to mix well. And there you have it: enough sauces to make it through the summer. Here in France, we’re not having one yet, but hope springs eternal. On Independence Day 2013, the Statue of Liberty re-opened to the public. 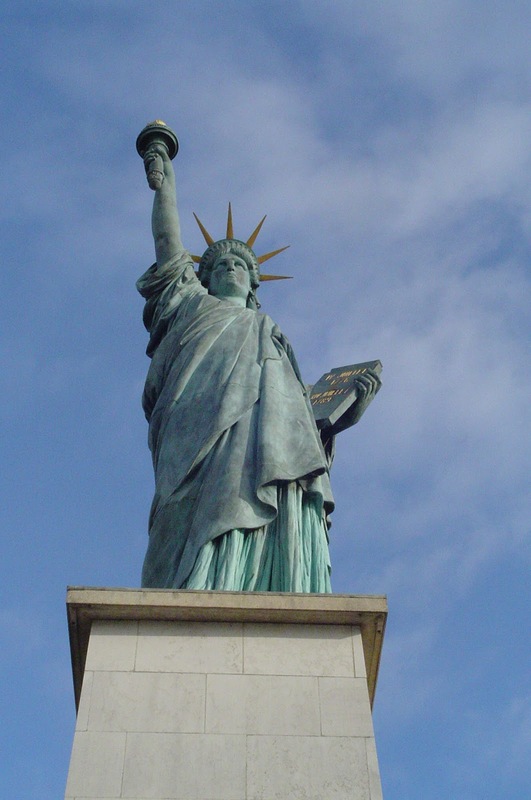 Hurricane Sandy had done it considerable damage and the famous statue was closed for eight months for repairs. The hurricane put 75% of the island it stands on underwater. The dock and paths were destroyed. But the statue itself came out of the storm unscathed. “Tempest-tost”, like the homeless huddled masses immortalized on its bronze plaque. But unscathed. Still standing where it has stood since 1886. And that’s largely thanks to the French artist and engineer who designed and built her well. Their gift to mark the friendship that unites France and the United States. The idea of sealing Franco-American friendship with a statue came from a French politician named Edouard René de Laboulaye. The Americans would provide a site - Bedloe’s Island - and build a pedestal; the French would create the statue. Both countries were going through hard financial times. On the American side, future President Grover Cleveland, then Governor of New York, vetoed the project’s funding, and Congress also refused. That’s when publisher Joseph Pulitzer called for donations in his papers so work could continue. 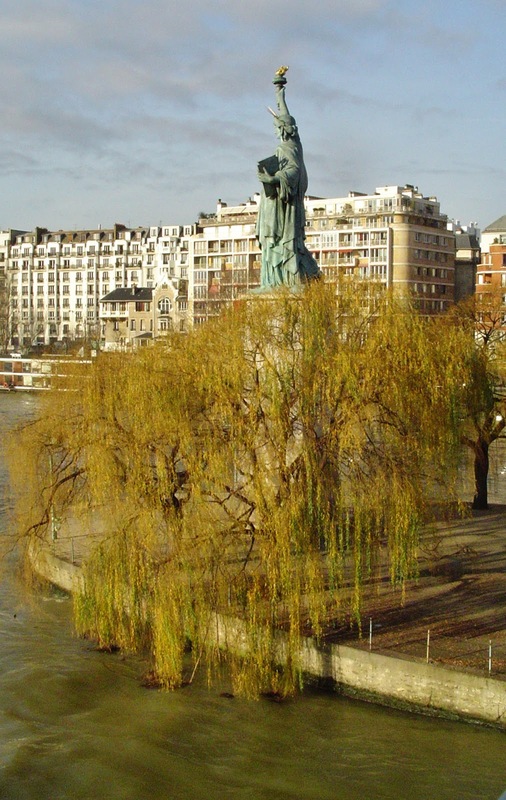 Meanwhile, back in France, the statue was being designed by sculptor Frédéric Auguste Bartholdi. The idea of liberty was dear to him. He served in the French army during the Franco-Prussian War, in which his native Alsace was annexed by Prussia, and was a liaison to Garibaldi, the leader of Italian liberation. 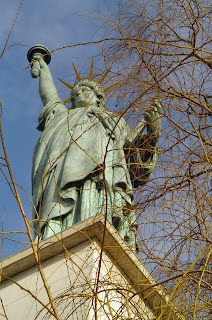 That may be what gave Bartholdi the idea of using the Roman goddess of freedom with broken chains at her feet. The tablets she holds bear the date of the Declaration of Independence, accentuating the freedom motif. The face is said to be that of Bartholdi’s mother. The head was completed for the 1878 World’s Fair. And the right arm was shipped to America for its Centennial festivities in Philadelphia, and from there to New York where it waited patiently for the rest of the body to arrive. Bartholdi decided on copper for the “skin” of the statue, not only because of its color but also because of its light weight. The sheer size of the statue was daunting: 151 feet 1 inch. It was the largest statue in the world when it was built and remained the tallest structure in New York City until the Empire State Building surpassed it in 1929. So the framework holding the whole thing together was a key issue. Initially the framework was to be brick, and designed by Viollet-le-Duc, the architect who rebuilt much of France’s historical monuments in the 1800s. He worked on the head and right arm, but then fell ill and died. Gustave Eiffel, an expert in wind stress, was chosen to take over, designing the massive four-legged iron pylon and the secondary skeleton that allow the copper skin to move independently yet remain upright. The statue’s skin was to be riveted to the skeleton with metal straps. 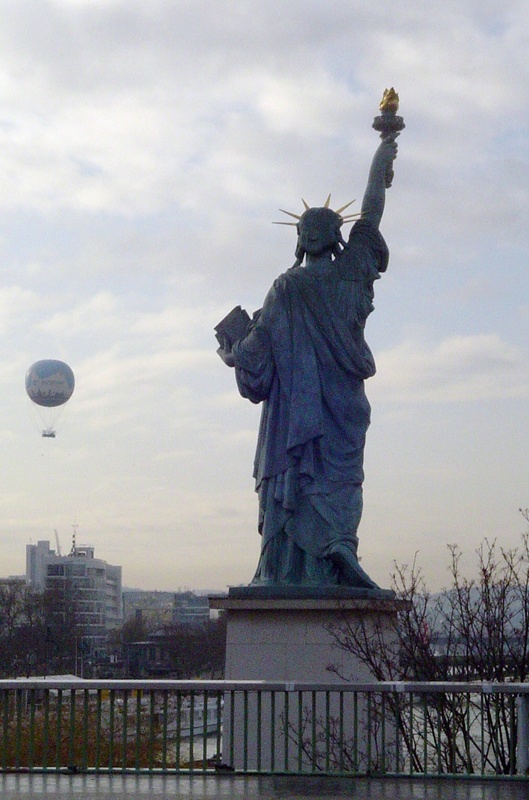 Eiffel used the same principles for Lady Liberty as for his namesake Tower; they take into account movement in the wind, expansion in summer and contraction in winter. 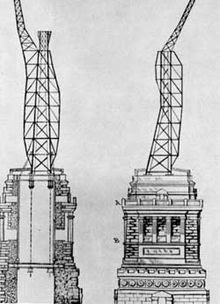 The framework was built and erected in Eiffel’s factory in Paris, then dismantled for shipment. The statue arrived in pieces on French Steamship Isère on June 17, 1885, and only required reassembly. But that had to wait until the United States finished the base in April of 1886. On October 28, 1886, sometime in the afternoon, now President Grover Cleveland - the same person who, as governor, had vetoed funding for the pedestal - dedicated Liberty Enlightening the World. The festivities included the first ticker-tape parade ever. By 1984, Lady Liberty was in sad state. A joint private/public project restored her and two years later the statue reopened in time for its centennial. Then came Hurricane Sandy. For many years, including those of my childhood, you couldn’t go up into the flame of the statue because of a weakness in Lady Liberty’s right biceps. But I’ve been up the spiral staircase into her crown twice. It’s quite a view! And like all those immigrants gazing at her as they sailed into New York Harbor, including probably my own great-grandparents, I also gazed at her from the ocean. But I was sailing in the other direction: out of the harbor on Le France, on my own journey from America to France. There are other statues of liberty around the globe. Replicas that is - in Europe, Asia, North and South America, Australia... only Africa seems not to have one. But more importantly, there are two originals by Bartholdi in Paris, scale models that he made before the final one standing on Liberty Island in New York Harbor. - The first, a bronze model, is in the less-traveled southern part of the Luxembourg Gardens and dates from 1870. - The second stands proudly in the Seine River on the Ile aux Cygnes, not far from Eiffel’s Tower. She faces down-river, west towards her sister in America, dates from 1889 and measures 37' 9" (11.5 m). 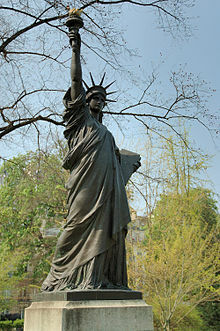 - There is also a life-size replica of the statue’s “Flame of Liberty” which was a gift from the United States for the American Statue’s centennial (1986). As it stands above the Pont d’Alma car tunnel where Lady Diana died, it has become an unofficial memorial to England’s Princess and is almost always surrounded by bouquets of flowers. Note: None of these photos is of the Statue of Liberty in New York. All are in Paris. 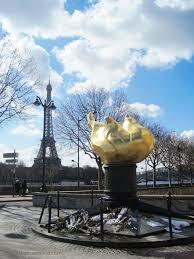 The photos of the flame, Eiffel's framework, and the statue in the Luxembourg Garden are not mine; all the others are.